* An extract from one of his letters months. In a dearth of new tilings on will give some idea of this plan, which each of those heads, to extract out of never took effect. “I spoilt the whole the French Memoirs, German Epheafternoon yesterday with Dr. Pother- nierides, &c. such things os shall apgill in settling the plan of our design, pear to the society to be useful discowhich in short is this by a settled re- veries or observations, and not suffigular correspondence in the principal ciently known or attended to. The cities of Europe, to have the most early greatest difficulty lying on us is the intelligence of the improvements in choice of proper persons to execute chemistry, anatomy, botany, chinir- this design some being too much gery, with accounts of epidemical di- taken up in business, and others justly seases, state of the weather, remark- exceptionable as being untractable, able cases, observations, and useful presumptuous, and overbearing. The medicines. A society to be formed men of business, however, will he of here in town, to meet regularly once a some use to us, in communicating reweek, at which meeting all papers trans- markable. cases and occurrences. Such milted to be read, and s,uch as are ap- a work will require a great number of proved of to be published in the Eng- hands; and, besides good abilities, it lish language, in the manner of our will be neiessary they should be good Philosophical Transactions a pam- sort of men too.” ms Letter to Dr. phlet of 2s, or 2. 6d. once in three Cuming. | met with proper encouragement from the public, it was his intention to have extended the work to twelve volumes, with an additional one of index, and that he was prepared to publish two such volumes every year. 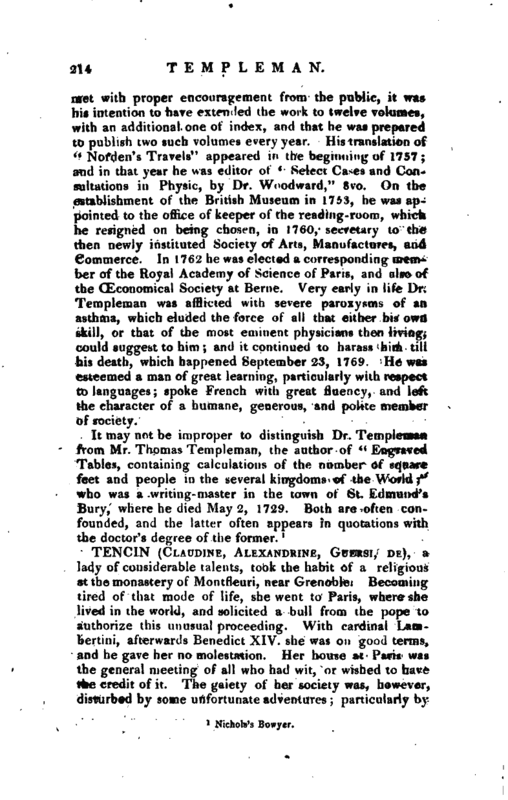 His translation of “Norden’s Travels” appeared in the beginning of 1757 and in that year he was editor of “Select Cases and Consultations in Physic, by Dr. Woodward,” 8vo. On the establishment of the British Museum in 1753, he was appointed to the office of keeper of the reading-room, which he resigned on being chosen, in 1760, secretary to the then newly instituted Society of Arts, Manufactures, and Commerce. In 1762 he was elected a corresponding member of the Royal Academy of Science of Paris, and also of the CEconomical Society at Berne. Very early in life Dr. Templeman was afflicted with severe paroxysms of an asthma, which eluded the force of all that either his own skill, or that of the most eminent physicians then living, could suggest to him; and it continued to harass him till his death, which happened September 23, 1769. He was esteemed a man of great learning, particularly with respect to languages; spoke French with great fluency, and left the character of a humane, generous, and polite member of society.